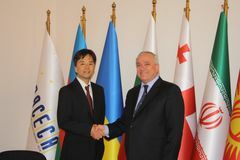 02 July 2015 at the Headquarter of TRACECA Mr. Mircea Ciopraga, Secretary General of the PS IGC TRACECA received Mr. Takao Imanishi, First Secretary and Mr. Toshihiro Katagiri, Attache of the Embassy of Japan in the Republic of Azerbaijan. Mr. Imanishi and Mr. Katagiri expressed their interest about the latest developments within the framework of IGC TRACECA, member-countries involved in the activity of TRACECA as well as areas of cooperation. Mr. Ciopraga informed that 13 countries are member-states of the IGC TRACECA. As an international EU programme TRACECA aimed at strengthening the economic relations, trade and transport communication in the regions of the Black Sea basin, South Caucasus and Central Asia. Discussion also touched the issues of ongoing and completed technical assistance and infrastructure projects in Road Safety, Maritime and Aviation fields. Provisions of the Basic Multilateral Agreement on International Transport for Development of the Europe-the Caucasus-Asia Corridor (MLA) and its Technical Annexes, signed in 1998 determined the main aims and objectives of the regional transport cooperation among the participating countries. Mr. Ciopraga exchanged views with the participants of the meeting on the issue of cooperation with Japan as well as with different stakeholders, international structures and IFIs. Regarding the issue of TRACECA enlargement Mr. Ciopraga added that Afghanistan and Pakistan express their interest in accession to TRACECA. Parties of the meeting agreed to continue discussion and find possible ways of cooperation.